In Wet Felted Fiber Beads, participants will learn how to create felted, spherical beads from raw wool fiber, then transform the beads into earrings, necklaces and other forms of jewelry. Attendees will also explore how to felt “sushi roll” beads with multiple colors of wool and transform those beads into various forms of jewelry. In Wet Felted Vessels, each participant will create a 3-dimensional wool vessel. Wool fibers will be layered around a foam resist, wet with slightly soapy water, then rubbed and rolled to tangle and bind the fibers together to form the felt. To shrink and full the forms, attendees will squeeze and manipulate them to make them more dense and thick. “Felt-making is a very physical activity,” notes instructor Christie about the vessel workshop. “Most of the work will be done while standing. Wear comfortable shoes and clothing that you don’t mind getting wet!” Those curious about felting but wishing for a less rigorous experience will find it with the bead workshop. Christie is an artist and educator living in Cherryfield, Maine. Her artwork, which takes many different forms including public installations, bingo and community dinner ‘happenings’ and a mobile fiber art studio, explores a variety of themes including ethics, craft, localism, conviviality, and the rural and community. She has taught numerous felting workshops for Schoodic Arts for All, Eastport Arts Center and Adult Ed programs in Washington and Hancock counties. More information about Christie can be found at www.audrachristie.com and AUD Art (www.facebook.com/AUDart/). 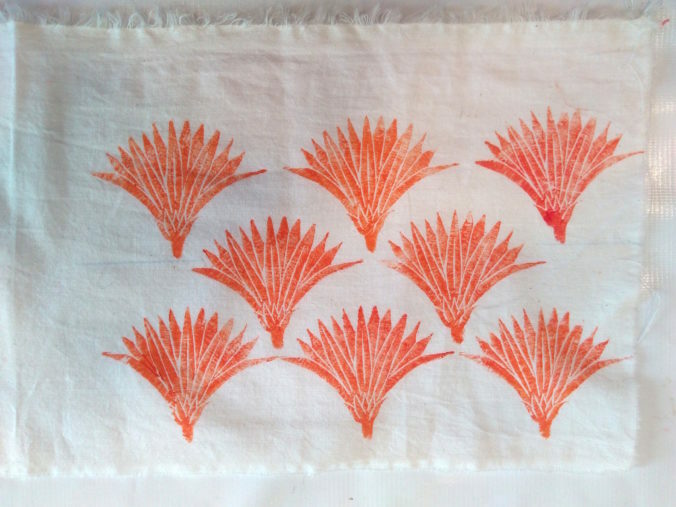 Eastport Arts Center will offer a two-part workshop in Block Printing on Fabric on Saturday, March 2, and Saturday, March 9, from 12:30-4:30 pm. Instructors Susan Lehnen and Sasha Lehnen-Spencer will guide students in an exploration of printing on fabric using hand-cut stamps. Participants will create their own symbols to experiment with, and, in Lehnen’s words, will “play together with color and design to get a feel for these techniques and to create unique works of textile art.” The course will include discussion of textile stamping in a historical context as well as the development of symbolism within the cultures who cultivated these techniques. Susan Lehnen is an artist and teacher. She has three grown children and lives off the grid in the Perry woods with her husband Bill, their 2 dogs and 4 cats. She holds a BFA from Michigan State and an MS in Synaesthetic Education from Syracuse University. Sasha Lehnen-Spencer is a lifelong art maker. She received her BFA from Maine College of Art with a concentration in sculptural ceramics. Sasha explores many mediums, with clay and fabric as her favorites. Her business, Foxy Fix-It, offers alterations and adornment for clothing and housewares as well as sewing alteration instruction. She regularly teaches classes in up-cycling, ceramic hand-building, and with her mother Susan Lehnen teaches fabric surface design techniques. This workshop is intended for participants ages 12 and up. Workshop fee, which includes materials and covers both sessions, is $60. For those who need it, all of our workshops are offered by sliding fee scale, thanks to support from The Belvedere Fund. Preregistration is required; please email alison@eastportartscenter.org, or call (207) 454-8822 to reserve your spot or for additional information. The Eastport Arts Center is at 36 Washington Street, Eastport, and is handicapped-accessible. The Eastport Arts Center will resume its Life Drawing Workshop on January 16. The group will meet each Wednesday evening from 7:00 to 9:00 pm on the first floor of the Arts Center. 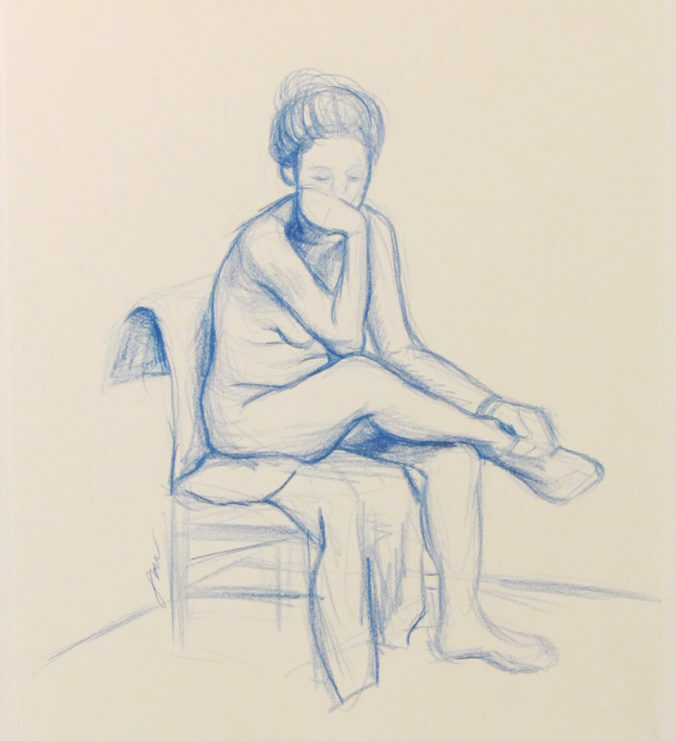 Participants in the two hour weekly workshop will approach drawing the figure through a series of short exercises that lead to an hour long study, using the drawing medium of their choice. Learning to draw the figure has long been the foundation of learning how to draw. Through history it has been both an academic exercise and a demonstration of mastery. The arts center’s emphasis is to offer a learning experience for beginners, and for more experienced artists an opportunity to hone their drawing skills. Instruction is offered when requested. Students and artists may sign up for four weeks at a time; however drop-ins are also welcome. The workshop fee is $12 per session, or $40 if a participant signs up for four sessions. Participants must bring their own drawing or painting supplies. For further information, please call Joyce Weber at (207) 853-2358, or e-mail at jpweber@roadrunner.com.